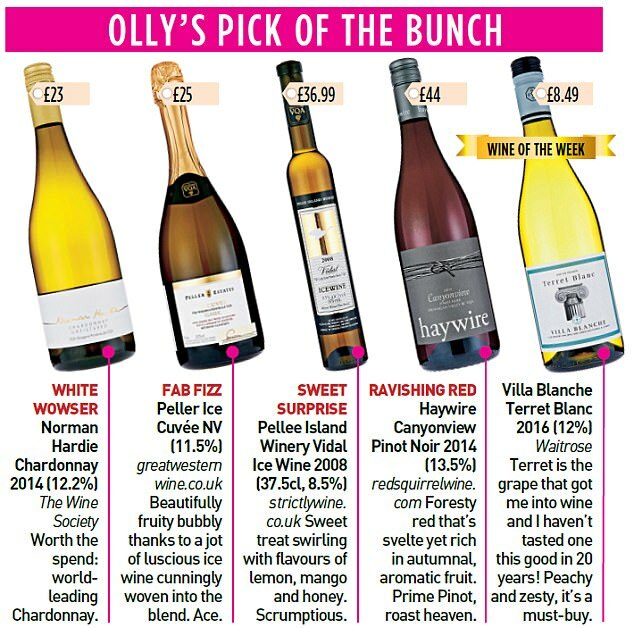 CB Riesling gets a shout out in the UK’s Daily Mail! From Mounties to maple syrup, Canada exudes a love for the great outdoors. You may have dreamt of Niagara’s thundering falls, or dipped yourself in the vibrancy of Vancouver, but have you ever sipped Canadian wine? You should. In fact, one of the most popular wines in my own wine bars comes from Canada – the fizz recommended below. But it’s sweet ice wine that’s the most famous Canadian vino, thanks to reliably freezing local winters. Ice wine is a luscious treat crafted from grapes that are frozen on the vine. When crushed, the water separates from the oozing sticky treasure that sweet-toothed wine fans adore. Pillitteri Estates 2015 Vidal Icewine (10.5%, 20cl) is a cracker for £12.99 from laithwaites.co.uk. Beyond ice wine, Canada is capable of producing stunning reds and whites from its sprawling landscape – remember, it’s the second largest country in the world by area. In the main, Canadian wine pours out of Ontario – Charles Baker Stratus Riesling Vinemount Ridge (11%) 2012 is a great example that blew me away, with appley purity balanced with a lovely little bit of richness – a stunner for £21.38 from gpbrands.eu. British Columbia (Okanagan Valley in particular) is also a big player, and there are bottles to be found from Quebec and Nova Scotia. Water moderates the extremities of the Canadian climate, protecting vineyards with an endless coastline of huge lakes as well as the Atlantic, Arctic and Pacific oceans. And while the tradition of wine-making has long been established, wine on a commercial scale was only permitted in 1974 after Canadian Prohibition ended in 1927. With everything from Chardonnay to Riesling and Cabernet Sauvignon to Pinot Noir, Canada is coming up with crackers.